The most common signs of aging is an increase in unattractive fines lines and wrinkles. The aging process is often stimulated by improper skincare as well as excessive drinking and/or smoking. Throughout the years, vitamin E oil has been proven to significantly slow the signs of aging. While vitamin E can be chemically produced in a lab, the most natural form of vitamin E is obtained from a food source by a manufacturer. Skincare products that contain lab-generated vitamin E or synthetic vitamin E often contains potentially harmful ingredients like hydroquinone; therefore, people will need to have more caution while using these types of items. On the other hand, natural vitamin E oil is not formulated with dangerous components, so the products can provide the skin with numerous great benefits. For those who would like a youthful appearance, check out our guide the the best vitamin E oils on the market. Sold by Health Priority Natural Products, the Vitamin E Enhance Organic Oil promises to heal damaged skin, diminish pigmentation, and minimize the signs of aging in just thirty days. Since the product only contains ingredients that are sourced from Mother Nature, the organic item is sure to produce results that everyone desires. The product is also praised for its calming and aromatherapy benefits. Manufactured in the United Statess, the Vitamin E Enhance Organic Oil is made with 100 percent organic ingredients. Health Priority Natural Products has created the product with entirely natural components such as avocado oil, rice bran oil, lavender oil, palmarosa oil, jojoba oil, and vitamin E. These potent ingredients work synergistically to repair damaged skin and reduce the signs of aging. The unique blend of these components have also been shown to fade unattractive dark spots, hydrate the skin, smooth fine lines/wrinkles, and improve skin tone/texture. The one fluid ounce bottle contains 15,000 IU. This Non-GMO, Non-SMO, and cruelty-free product does not contain soybean oil or other cheap oils. As you are shopping for the Vitamin E Enhance Organic Oil by Health Priority Natural Products, try searching for a tinted bottle with a white label and black top. The label displays the product’s important in vibrant yellow print. The directions on the back of the label states that users should apply the product twice a day to affects areas such as the face, neck, and chest. Weighing only 1.6 ounces, the size of the product is 3.5 x 1 x 1 inches. The product is sold complete with a money-back guarantee, so you can purchase the vitamin E oil absolutely risk free. If you do not notice results with thirty days of purchase, contact the company to receive a full refund. There will be no questions asked during the proces, but the company is always happy to receive suggestions to improve the products. 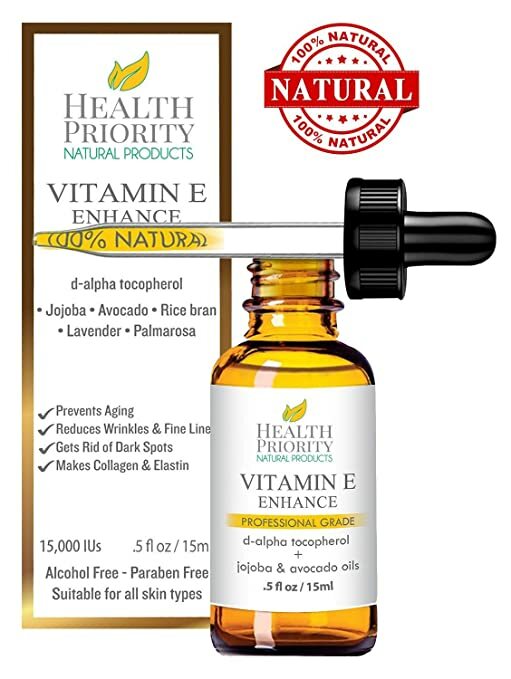 In addition to the generous guarantee, the product is also sold with a special phamplet that is titled “8 Poisonous Ingredients In Your Skincare Products.” Due to its popularity, the Vitamin E Enhance Organic Oil sells out extremely fact. Order the product today to experience the many benefits of organic skincare product. Recommended by doctors worldwide, the GreatFull Skin Vitamin E Oil is specifically formulated for those who would like vibrant, beautiful, and glowing skin. The product is most recognized for its antimicrobial properties, extremely affordable price, quick/easy application, complementary ingredients, exceptional results, and much more. After just three to four weeks of regular application, you should notice a substantial improvement in the appearance of your skin. Because of super amazing and quick results, the GreatFull Skin Vitamin E Oil should definitely be added to your skincare regime. The GreatFull Skin Vitamin E Oil is produced only with natural ingredients. The company has included coconut oil ester to retain skin’s moisture, serve as an anti-oxidant/humectant, provide a non-greasy barrier of protection, and nourish the hair, skin, and nails. Coconut oil ester may also contribute to the product’s texture and smooth application. Along with its smooth consistency, many users have enjoyed the slightly woody scent of the product. The product’s aroma is due to the inclusion of coconut oil ester. The product is also formatted with its most important ingredient vitamin E oil to protect the hair, skin, and nails from environmental elements as well as reduce dryness, fine lines, and wrinkles. The item contains 10,000 IU per a bottle. The product does not contain any fillers, preservatives, or unclaimed ingredients, so it’s extremely unlikely that you will experience an adverse skin reaction while using the product. The GreatFull Skin Vitamin E Oil has not been tested on animals. Throughout the years, the product has been proven to benefit many users with a variety of skin types. This natural item may play a role in resolving certain skin concerns such as acne scars, crows feet, blemishes, wrinkles, dry/itchy scalp, razor burn, sun damage, pigmentation, burns, and cracked/chapped skin. The product may also treat common skin conditions like irritated/inflamed skin and eczema. Additionally, the product can heal cracked cuticles and strengthen nails. Many customers have even used the product as a tattoo and sunburn after treatment. One of the best ways to nourish, hydrate, and rejuvenate the skin is to use the product on a regular basis. The product can be used on your face, body, hair, and even cuticles. Simply apply one to two drops of oil on the skin, and then massage into your skin with circular motions. In order to promote the best results, massage the product on your skin following the application of vitamin C and hyaluronic acid serum. When you’re using the product at night, you may want to remove the excess oil from your face with a damp cotton wool. This important step will ensure that the product does not seep into your eyes while you are sleeping peacefully. The GreatFull Skin Vitamin E Oil can also be used very effectively after receiving skincare treatments such as microdermabrasion and derma roller as the coconut oil ester can penetrate into the pores easier. The item can also be added to your favorite skincare products. The GreatFull Skin Vitamin E Oil can be applied twice a day. The GreatFull Skin Vitamin E Oil is made at a FDA-approved facility in the United States. The product is sold in a small 1-ounce tinted bottle with a white label. The vitamin E oil is stored in a brown glass to protect its properties from sunlight. The label elegantly displays the name of the company, product, and ingredients. A premium glass dropper is included in the bottle. The product is on sale for a limited time only. Order the item soon to receive the product while supplies are currently available. GreatFull Skin offers a money-back guarantee with every purchase, so simply contact the customer service team to receive a full refund if you do not notice any results. There will be absolutely no questions asked, and you do not need to return the product. The product measures 1.2 x 1.2 x 1.5 inches and weighs about 3 ounces. The GreatFull Skin Vitamin E Oil is expected to last for at least two to three months. Developed solely for skin use, the Vital Care Vitamin E Oil is one of the only skincare products that is a great value for the money. Many people have purchased the product to replenish, revitalize, and restore the skin’s natural beauty. As a powerful antioxidant, the oil can even combat the common signs of aging such as stretch marks, scars, and wrinkles. The product is made with 100 percent natural ingredients; therefore the item is ideal for super dry skin. This skincare product is formulated with ingredients such as vitamin E and mineral oil. The product also contains age-defying antioxidants. Since the item has a concentration of 4,000 IU, the product is a mild vitamin E oil. 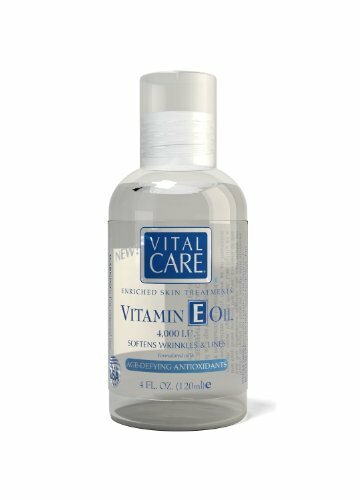 The Vital Care Vitamin E Oil is designed to soothe dry/itchy skin, soften fine lines/wrinkles, and promote smooth skin. The product can penetrate into the pores quickly, so the vitamin E oil does not need to be removed from the skin after application. The product can be identified by search for a clear bottle with blue print. The size of the product is 2 x 1 x 2 inches, and the weight is 4.1 ounces. Experience the amazing benefits of Vitamin E by purchasing a wonderful skincare product known as the Sundown Vitamin E Oil. The Sundown Vitamin E Oil is extremely concentrated. The primary ingredient in the product is tocopheryl acetate or vitamin E of around 70000 IU. The oil is also formulated with a form of vitamin E known as gamma tocotrienol. The product is free from gluten, wheat, artificial colors, and lactose. The Sundown Vitamin E Oil is not tested on animals. There are many benefits to regularly using the Sundown Vitamin E Oil. According to many customers, the product has been shown to reduce the appearance of fine lines/wrinkles, diminish blemishes, hydrate the skin, relieves minor burns, removes stretch marks, protects the eyes from dark circles, promote youthful/radiant skin, minimize skin damage from free radicals, control the oil secreting glands, heal most types of scars, improve the recovery of skin tissue, and soothe dry/itchy skin. 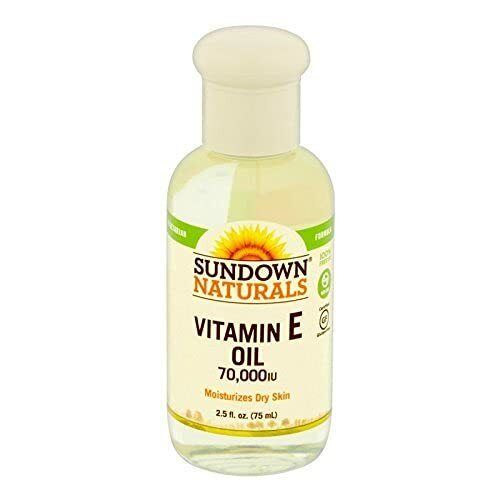 The Sundown Vitamin E Oil is most commonly used as a night cream. After removing your makeup, massage a generous amount of the oil into your skin for maximum penetration. The product can also be used during a bath to promote super smooth skin. The vitamin E oil will easily absorb into the pores, so you don’t have to worry about the product leaving your skin greasy. Additionally, the item can be adde to your favorite shampoo and conditioner to create extremely soft and silky hair. As an effective hair care enhancer, the product can moisturize and nourish the scalp. The Sundown Vitamin E Oil should not be applied to broken or irritated skin. Avoid using the product on areas affected by rashes. Made in the United States, the product is sold in a clear bottle with a tan label. The label states the name of the product, company, and the tagline “so pure it’s clear.” The bottle measures 1.5 x 4.2 x 1.5 inches and weighs roughly 2.4 ounces. The product is not recommended for people suffering from bleeding disorders as the oil may stimulate more bleeding. The item item should not be used on children or animals. The Sundown Vitamin E Oil is intended for external use only. Due to its sticky consistency, most vitamin E oils are formulated with other natural components. While these products often have a light brown/reddish hue, the purest form of vitamin E is clear in color. One of the primary forms of vitamin E is tocopheryl acetate. As an FDA-approved ingredient, tocopheryl acetate is recognized as a safe component. The most common ingredients used with vitamin E oil are soybean oil, olive oil, coconut oil, and almond oil. The combination of these components can create a product with the right viscosity. Vitamin E also has a distinct odor; therefore, many companies include natural fragrances in the products. Additionally, many skincare experts recommend purchasing vitamin E oil that is combine potent antioxidants such as vitamin C and CoEnzyme Q10. Most importantly, try to avoid products that contain parabens, fragrances, artificial colors, sulphates, binders or fillers. Always review the product’s label before buying vitamin E oil. Although most skincare products state the directions on their labels, it’s a good idea to understand the general application of vitamin E oil. Since the item has been shown to react with carcinogenic products, you should thoroughly remove your makeup before massaging the oil on your face. These types of products can provide the skin with intense hydration, but because of its thick consistency, the product should not be used as a daily moisturizer. After you apply the oil to your skin, you can enhance your skin’s softness by applying your favorite moisturizer. Avoid applying the product near the eyes. If the product accidentally touches your eye, rinse the affected area immediately with warm water. In order to yield maximum benefits, most companies advised users to apply the product to the affected areas at least twice a day. Consider consulting with a determatologist to determine the most appropriate application process for your skin type. There are many advantages to regularly using vitamin E oil. Because of its many benefits, oil is known as an extremely versatile product. According to the book “Healing and Vitamins,” the most effective products have been should to prevent free radical damage, slow the formulation of wrinkles, facilitate collagen production, retain skin’s natural moisture, support new skin cell growth, stimulate cell regeneration, prevent cracked cuticles, soften dry lips, diminish pigmentation, reduce inflammation, enhance the immune system, and inhibit platelet aggregation. Although vitamin E oil does not typically cause irritation, those with sensitive skin should study the product’s potential side effects. Some skin types are sensitive to vitamin E, but it’s a rare occurrence. If you notice skin reactions such as inflammation, redness, breakouts, or itchiness, you should discontinue the product immediately. In order to prevent unexpected irritation, thoroughly research the effects of vitamin E on your skin type. You may also want to consult with your dermatologist to determine the best vitamin E oil for your unique needs. Alternatively, you test the product on a small area of skin to ensure that you do not have an allergic reaction. Almost every vitamin E oil is sold a moderately sized bottle that can range from 0.5 ounces to 4 ounces. These glass bottles are typically dark in color so that the rays of the sun do not disturb the item’s properties. The company should have included the product’s name, ingredients, and intended uses on the box. The application directions should also be displayed on the box. If you notice that a product’s box is missing key information, you should continue on your search to discover the best vitamin E oil. Although vitamin E is commonly found in delicious foods such as spinach, mangos, and raspberries, probably the easiest way to benefit from this key nutrient is to regularly use products with this nutrient. Many studies suggest that the nutrient may promote a healthy cell membrane, stimulate blood flow, and strengthen the heart. These types of beneficial products are also known for their potent antioxidant and anti-aging properties for the face, nails, and hair. The potential benefits natural vitamin E oil are truly endless. Due to the many advantages of the skincare products, product continues to be one of the best selling items on the beauty industry. Our list of the top vitamin E oils contains many of the most purchased skincare products.